On Sunday November 18, Veterans Isle was a location of a fundraising concert. 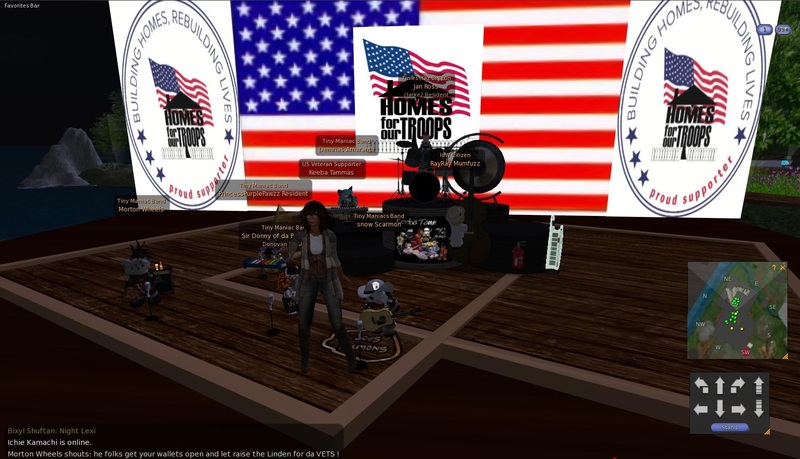 This was their monthly benefit event for the "Homes For Our Troops" charity, which helps veterans avoid homelessness. The concert was organized in part by musician Frets Nirvana. 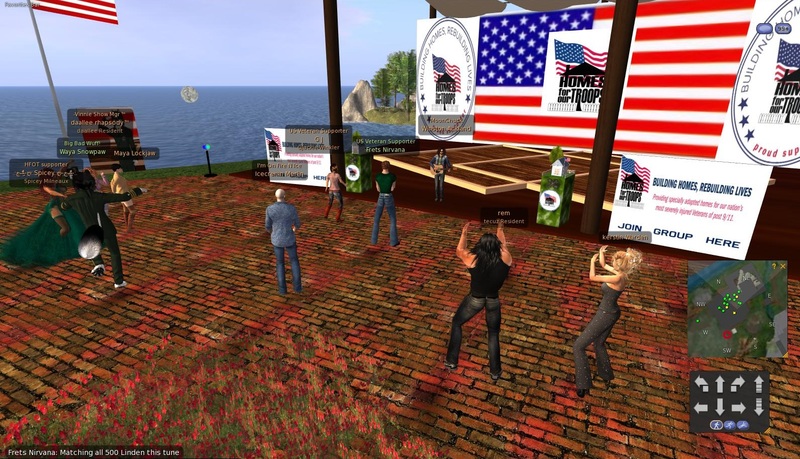 One DJ and a number of live musicians took part. The event was scheduled for 10 AM to 2PM, but it went on until 3PM. I dropped in while Winston Ackland was on stage, singing while strumming the strings of his guitar. People were donating cash into kiosks on either side of the stage. Occasionally Frets or someone else would offer to match large contributions. 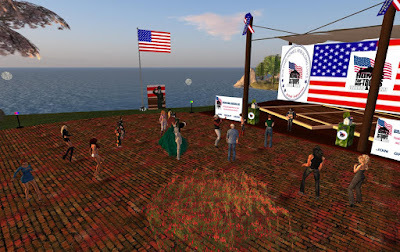 At one point, G J (GJackie Winkler) shouted, "Folks, if you're wondering why Homes Four Our troops is so important, imagine trying to use your hands to move your body through doors too tight, looking at stairs you can't climb any more, reaching for stuff you can't reach in cabinets, trying to cook in a stovetop,, getting in and out of tubs or showers safely, that's my real life. Life, folks, as a disabled veteran. This is why homes for our troops is so important, severely disabled war veterans coming home injured, broken, and needing safe homes, places they can have control of their abilities to care for themselves and their families. I don't ask for myself. I ask for my brother and sister veterans and their families. Please, if able, fill those kiosks up. Bring friends. Thank you." Eventually, Winston stepped off the stage, and it was time for the final group of performers, Keeba Tammas and her "Tiny Maniacs" band, "lets raise da Lindens fer da VETS!" Frets encouraged the crowd, "Folks ...think about all we have to be thankful for this week ...and especially the freedom we have. Our extremely wounded vets made the ultimate sacrifice to help ensure that freedom ...so please dig deep and help." 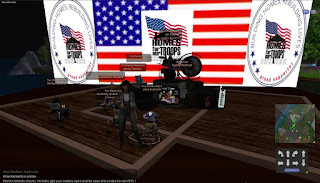 The crowd continued to donate, and by the end of the event, 135,000 Linden dollars, or about $540 US dollars, had been raised for HFOT, "Thank you to the amazing venue, Homes For Our Troops, and all of you here that do such a great job providing this awesome venue for us to come to, Winston for the wonderful music and all of you for this fantastic fun filled hour!"